April weather! One day it's summer and on the next one it's back to winter again.. Today started off gloomily. 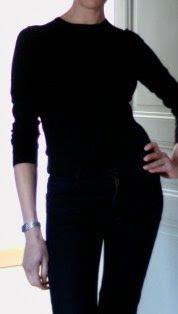 Feeling lazy, I've put on one of my trusted uniforms.. a pair of black jeans and a little black sweater. Very easy, but also a bit triste. Definitely a case for.. I am always amazed at the huge difference small things can make... the Twilly and the earings have certainly put some 'spring' back into my step! You are right... those two little additions made all the difference in the world. I think that I'm going to copy you tonight at dinner.